Hold sauce-coated wings in the slow cooker up to 2 1/2 hours on the WARM setting. Remove the celery and drippings from the crock. Add the chicken and cover with the lid. Cut celery ribs into three pieces and place in a lightly greased 6-quart slow cooker crock forming a rack. Stir together paprika and next six ingredients; sprinkle chicken with seasoning. Place half of the chicken on the celery rack; add half of the butter. Top with remaining chicken and butter. Cover with lid and cook on HIGH for 3 to 4 hours. Remove chicken from crock and place on a rack over a foil-lined half sheet pan; broil 5 minutes or until crispy. 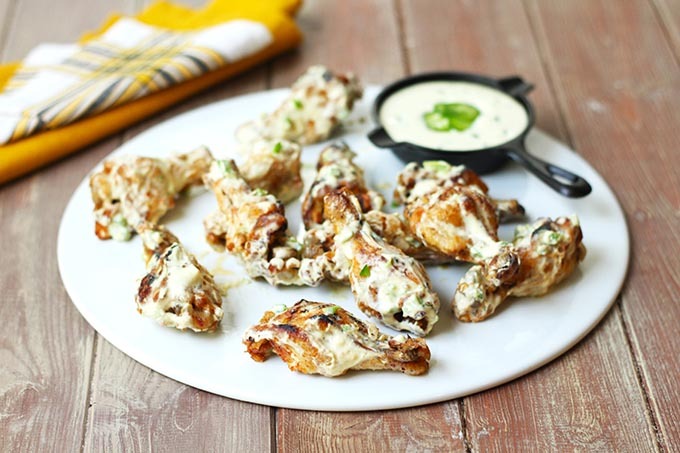 Toss chicken in 3/4 cup Jalapeno-Honey Mustard Yogurt Sauce. Serve with remaining sauce and celery. Stir together all of the ingredients. Makes 1 1/4 cups (prep: 5 minutes).